World War II history has always been an interest of mine (I blame my dad), but I had not heard of Oak Ridge, Tennessee or any of the other areas devoted to the making the atomic bomb. It is no surprise the number of women involved in the process, really, given how many women joined the workforce during that time in history. With many men off to fight in the war, there were jobs that needed to be done, not only to keep society running, but to help the war effort. Women stepped up to the plate willingly. It was also a time when the Depression was still fresh in everyone's memories. The work ethic was strong in most, and the desire to put food on the table making it a necessity. From early on in the scientific process leading up to the development of the atomic bomb, women played a significant role. Unfortunately, they were not always taken seriously. Ida Noddack and Lise Meitner were both indirectly involved with their theories and discovery of fission, for example. Other women were more directly involved in the process, but not often spoken about. And then you have your average worker off the street. Those who were hired to work at Oak Ridge and sites like it. Women like Celia Szapka, a secretary who had been working with the Manhattan Project for some time, and Jane Greer who was a statiscian-mathematician. Or Kattie Strickland who, alongside her husband, was assigned janitorial duties. Colleen Rowan was a leak-pipe instructor and Helen Hall was tasked with being a calutron operator. Rosemary Maiers was a nurse who helped open the first clinic at Oak Ridge. These were just a small few of the women who took jobs at Oak Ridge, hoping to make money, start a new life, and help the war effort. All the people at Oak Ridge except for those in the highest of positions knew exactly what was being made at the site. Secrecy was of the uptmost important. People living and working there were forbidden to talk about anything from their job duties to their living conditions. Anyone talking out of turn could end up losing their job and being evicted. Fear of spies getting a hold of the information was a real threat. All anyone really knew was that they were part of a team that was working toward ending the war quickly and once and for all--which everyone could get behind. Oak Ridge was a makeshift town on all levels. It was created in 1942 and was only just put on the map in 1949. Exactly what the town was for, what went on there, was a big secret. Even the neighbors had no idea. It was meant to be temporary. There were no sidewalks and lots of mud. More than one person ended up calf deep in mud because he or she wasn't watching where they were going. There were hutemats and dormitories and a small number of family dwellings, including trailers. The housing conditions for the African American workers was especially bad. Given the time period, I suppose it shouldn't be a surprise, but it was still quite appalling. While white families were allowed to live together and bring their children, African American families were not. Married couples were not even allowed to reside together. Complaints were made, but they didn't seem to go anywhere. Everyone did the best they could with what they had in the end. The town grew to 75,000 in population at its height, significantly more than initially predicted. Overcrowding was a problem. People came from all walks of life, big cities and small towns alike. Military personnel was rerouted to work on the project instead of going overseas because the project was just that important to the war effort. The bombing of Hiroshima brought everything into light. Oak Ridge's purpose was no longer a secret. It was one of the sites charged with enriching uranium for the atomic bomb. The people of Oak Ridge were hailed as heroes of sorts as their efforts truly did help bring an end to the Second World War. Still, there were mixed feelings. The scope and nature of the bomb and its effects were still not completely known. In all of this medical experiments were being done--often unknown to the test subjects themselves. Many of the women (and men) of Oak Ridge thrived in their makeshift town, forming friendships and bringing together a community of people from a wide variety of backgrounds. Even after the war, many wanted to stay on and make a go of keeping Oak Ridge alive. It still exists today. Denise Kiernan does a good job of bringing their stories to life and offering a balanced look at how and why Oak Ridge came to be in addition to what life was like there--the good and the ugly. Kiernan intereviewed several people and dug deep in her research. 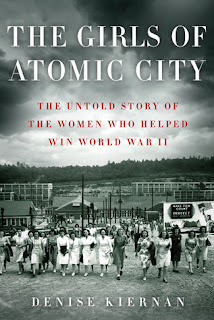 A part of me wishes she could have written more--more about the women featured in the novel as well as more about life in Oak Ridge. Even so, I think this book is good in terms of providing general information about an important historical time in U.S. history in a way that is accessible and relatable to the average reader. To learn more about Denise Kiernan and her books, please visit the author's website. Source: I purchased a copy of this book for my own reading pleasure. WWII stories are always hard to read, be it fiction or nonfiction. This one sounds like an intriguing read given the information and all. I might want to check this out at some point. Melody - It was interesting--a side of the war I hadn't really thought about. I am glad I read it. This sounds really interesting. Certainly a subject I know little about and a fictionalised account could make it very accessible. I enjoyed reading your summary and thankyou for visiting my blog. Cathy - This one is actually all nonfiction, based on interviews and documents researched by the author. It's quite good! Eustacia - I do too! I might have gotten to it sooner, but my father-in-law had borrowed my copy. It seemed like perfect timing though--reading it now, right after finishing A Dictionary of Mutual Understanding. Wasn't this book great? I went to an event for the author and there were people there who had lived in Oak Ridge as children and/or whose parents had met at one of those dances. The Q & A part of the event turned into a great discussion that was truly fascinating. Kathy - It must have been wonderful to be a part of that event you attended! I wish I had been able to go. I'll have to check this out! I've read several fiction books about women during WWII, but haven't read a nonfiction yet. Thanks for sharing! Alison - I hadn't read anything about this particular part of the War effort and so it was very enlightening. My library just got this on audio and I'm so excited! I love this time period and this is an area I don't know all that much about. I'm so glad you enjoyed it! Katherine - I hope you enjoy this one, Katherine! oh my, this is so my kind of book! Jillian - I hope you get a chance to read it! It was very interesting. One of my favorite time periods in history to read about. I simply must read this book. I'm adding it to my wishlist before I forget again! Andi - I thought I was the only one who took so long to get to it. :-) I hope you enjoy it when you get to it. I just bought the audio version last week when audible had a big sale... can't wait to listen. This sounds like such a fascinating story!